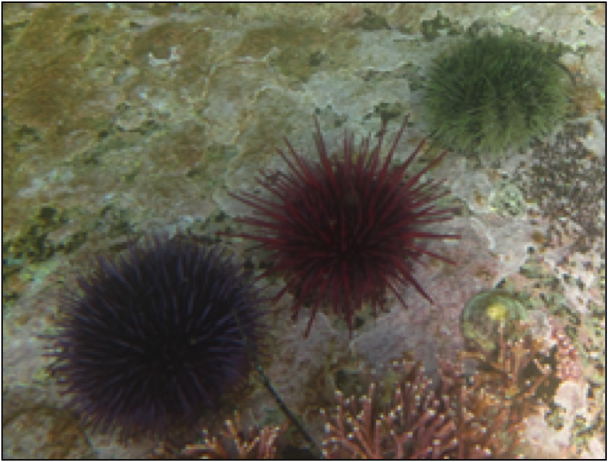 Left: the top (aboral) and underside (oral) of purple sea urchins. Photo by Kelly Fretwell. 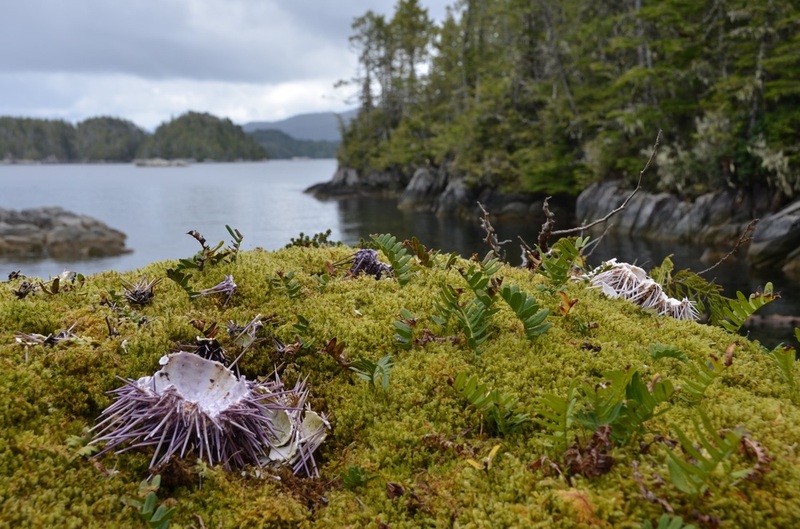 Top right: the remains of a purple urchin found scattered above the tideline by a predator, photographed by Kira Hoffman. Bottom right: the shell (test) of a larger purple urchin. Photo by Alanah Nasadyk. Adult purple sea urchins are an obvious purple colour, but juveniles can have light green spines, or spines in transition from green to purple. Adults usually have spines no longer than 2.5 cm, although the spines of urchins living in subtidal areas may be up to 6 cm long. The diameter of the test (shell minus the spines) is generally under 10 cm, and the height is about half the diameter. 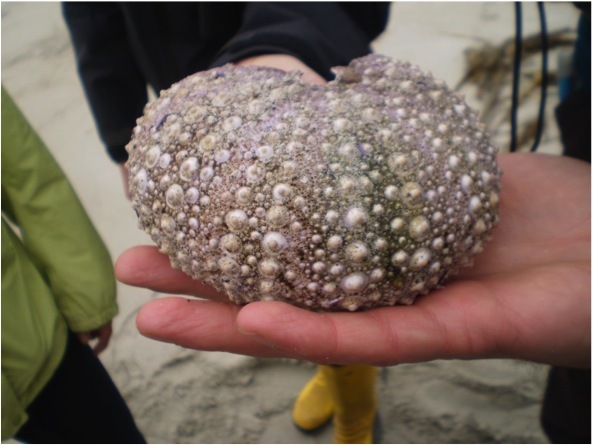 Purple sea urchins are found in both intertidal and subtidal zones. They are commonly found in exposed rocky areas, where they may erode small cavities into the rock. In intertidal areas they (and their rock depressions) can be found along shallow rocky ledges and in tidepools. This species is found along the west coast of North America from Cook Inlet in Alaska to Mexico; it is less common in the northern end of its range than the southern. 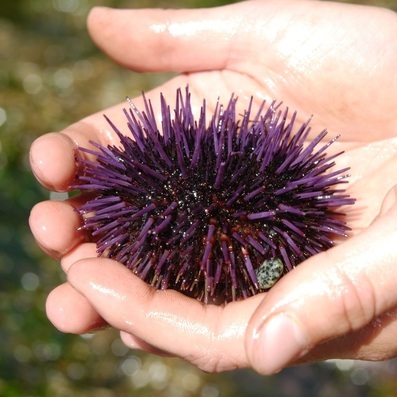 The green spines of purple sea urchin juveniles can potentially cause confusion with the green sea urchin (Strongylocentrotus droebachiensis). Conversely, green sea urchins (of all ages) can sometimes be a purplish colour. When these two species don't stay true to their names, their spines must be examined for proper identification. Green urchin spines are generally thinner, shorter, and quite crowded on the urchin's test. Small red sea urchins can be reddy-purple in colour, but grow larger and have much longer spines. Purple, red, and green urchins. Photo by Rosie Child. This species is commercially harvested, mostly in California, and exported to Japan where the species is considered a delicacy. Purple urchins are very well studied due to their important ecological role. They graze voraciously on algae, particularly kelp beds, and as a result can greatly impact habitat structure. They are part of a delicate balance: if they get out of hand they can turn a diverse kelp forest into a barren underwater landscape (termed sea urchin barrens), but meanwhile they are an important prey item for many species. These include sunflower stars, ochre stars, leather stars, some crabs, giant green anemones, and sea otters. They also compete with other grazing species like abalone. 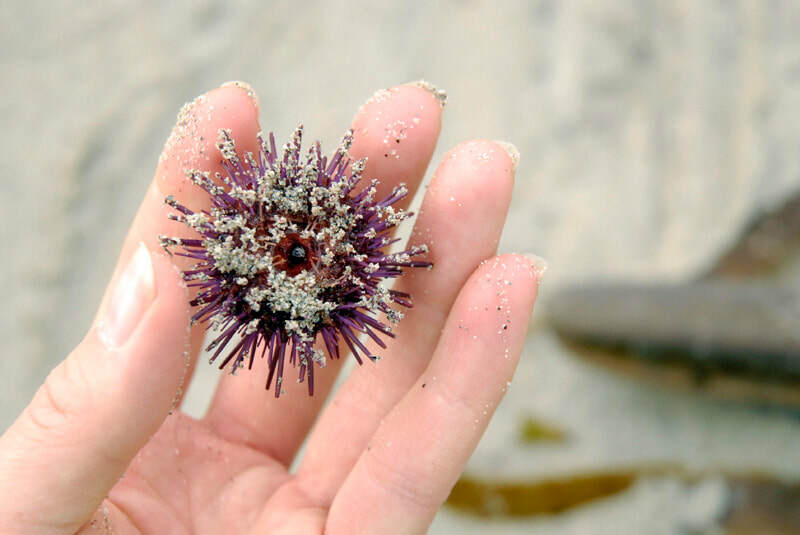 Purple sea urchin (Strongylocentrotus purpuratus). ARKive.org. Accessed 12/06/2013. Pearse, J. S. (2006). Ecological role of Purple Sea Urchins. Science.